With some technical help from people much smarter than me I’ve figured out how to do the blog on the move on my iThings, so I’m going to start blogging again. Perhaps regularly. Perhaps not. We’ll see. I suspect the frequency will depend on the response. Started the trip with a drive to our daughter Niki’s house south of Seattle. Flew to Houston where I visited schools in Katy, Texas… Morton Ranch Jr. High (which actually used to be a ranch, and there are still some cows around the school), and Wood Creek Junior High. I had a wonderful time at both schools. My friend, Betsy Erwin, set the visits up. Flew back to Seattle, where Marie and I hopped another flight back south to New Orleans for the International Reading Association annual conference. I signed I,Q at the Sleeping Bear Press booth, and Chupacabra and Storm Runners at the Scholastic booth on Saturday and Sunday. In between dinners and visiting old friends we managed four hours at the WW2 Museum, which I highly recommend if you are ever in New Orleans. I also recommend eating breakfast at The Ruby Slipper, which just might be the best breakfast I’ve ever eaten. Torrential rain, mid-80s, made for a rather soggy visit, but New Orleans was still a blast. The IRA conference remains my favorite conference. From New Orleans we flew to Bentonville, Arkansas to visit our other daughter, Bethany, and our first set of grandsons. The Bentonville middle schools and the public library put together a Read Roland program. The students all read Zach’s Lie. I spoke at Old High and Bright Field middle schools, then did an evening program at the library. Again, an awesome experience. This ended the trip’s official author duties. Spent the next few days hanging out at Bethany’s house, visiting The Crystal Bridges Museum, which everyone needs to go to, and eating the pesto crepe (#8) at the cart across from the 21c Hotel in downtown Bentonville two days in a row. 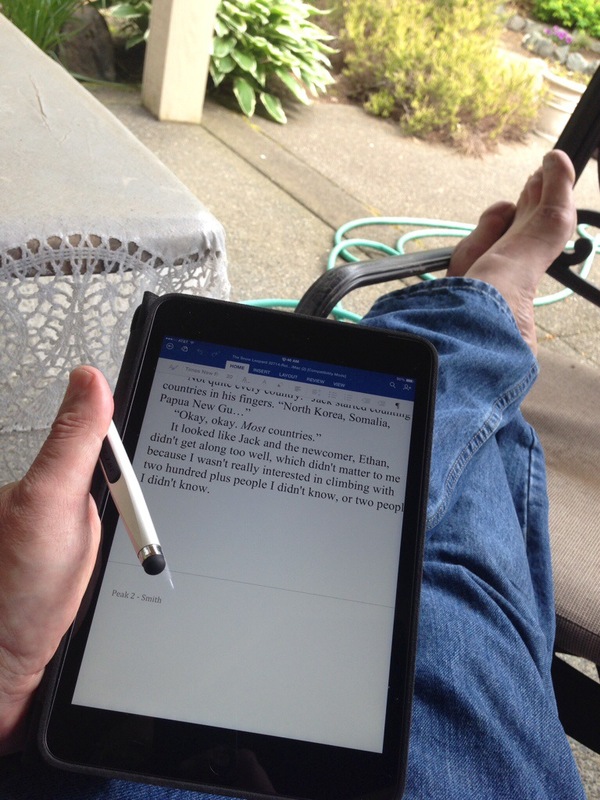 Then back to Seattle for the weekend, where I squeezed in some writing with noise-cancellation earbuds on my mini iPad. There is always time to write if you carry your writing with you, but there is no place to write like home. Arkansas is very close to your Missouri home….come visit! Say hello to Marie for me. Does that say “Peak 2”??! I didn’t know you’re writing a sequel…that’s my favorite of all your books! I will have to be on the lookout for that one when it comes out. Thanks for all your work – I’m a school librarian and our kids love your books. Sharp eye! The sequel to Peak will be out Fall 2015.